Friday night at the Robin Park Arena in Wigan, England also saw an exciting and entertaining undercard. 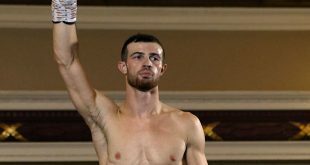 Former IBO Champion Brian Magee of Belfast faced Simeon Cover of Worksop in a six round super middleweight contest. Cover, of the Ingle's stable, has the trademark ‘fencing style’, but after a steady start by both men, Cover went down on the canvas after a right to the body. A big left punch from Magee in the opening seconds of round four sends Cover to the floor again. Getting up, Cover takes an onslaught from Magee and he almost ends up through the ropes. Seconds later, Cover falls back again and - shaking his head at his corner - is stopped by the referee. Magee wins by TKO round four to improve to 31-3-1 (21) while Cover drops to 16-41-2 (4). 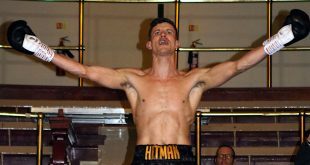 Steve Saville produced an entertaining fight against Mark Bett of Lanark, Scotland in a four round light welterweight contest. ‘Bomber’ Saville, from Wolverhampton, now living in Walsall, trains out of the Wednesbury Boxing Academy. Short and strong, the Black Country man is a popular fighter with a big following. In the first minute of round one, Saville lands a good right to the body followed by a left hook to the head of his opponent as Bett hasn’t settled in to the fight. Saville gets warned to ‘watch the head’ by referee Steve Grey, but seconds later, while he is backed on the ropes - Saville lands a peach of an uppercut. Bett looks undeterred and Saville lands a left just as the bell signals the end of the first frame. “Saville, Saville” the fans chant! In the opening minute of round two, Saville lands a huge right to the face of Bett, who falls heavily to the canvas. Having taken the count, Bett looks unsteady as Saville keeps up the onslaught. Looking for another big shot - Saville just misses his target and tries the uppercut. Bett holds on to Saville's right arm so Saville punches with his left while he is held. Bett complains to referee Grey - but it’s Bett doing the holding! A big left hook from Saville in the first half minute of the fourth and final round causes a ‘groan’ from the crowds, but Bett keeps upright, only to take another big left moments later when he falls to his knees. Betts isn’t counted this time, but has been clearly uncomfortable throughout the fight. Bett throws a couple of light jabs but it’s obvious that Saville is looking to land another ‘bomb’, and seconds later he does just that! Saville landing a huge swinging right to the face of Bett and gasps go around ringside spectators as Bett is on the canvas again. Having taken the count , Bett walks unsteadily towards the referee but Steve Grey calls off the contest - Bett unable to continue. Steve Saville wins by TKO round four and improves to 17-4 (7) while Betts drops to 5-7-5 (3). 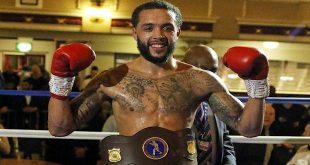 Welterweight Darren Askew, 4-1 (0), from Workington but now residing in Manchester, defeats Graham Fearn, 4-1 (1),of Yorkshire, on points after four rounds. 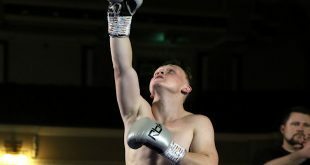 Light middleweight Steve O’Meara, 3-0 (1), of London, outpointed Billy Smith, 12-71-1 (0), of Stourport after four rounds. Welterweight Ali Shah, 2-0 (0), of Blackburn defeats the amazing Peter Buckley, 31-250-11 (8), of Birmingham over four rounds. Welterweight Khurrum Hussain, 7-1-1 (0), of Bradford, won on points over Paddy Pollock, 5-6-2 (1), of Wishaw, Scotland in a four rounder.